Amazon is still going strong with a bunch of great Lightning Deals and Holiday Toy Lightning Deals today! Each day Amazon will put up new items for sale at specific times throughout the day. They will give you some clues to so you have a fairly good idea what will be on sale. If you don’t have Amazon Prime and have not had a free offer lately you can sign up for FREE Amazon Prime Shipping for 30 days and get FREE two day shipping. This is great for the holidays! DO NOT complete that price checking price first because when you come back you might not be able to add the item to your cart. If you add it to your cart and find out the price is not that great just don’t check out. Last year and this year many people lost out on great lightning deals because they did not immediately add the deal to their cart. Today’s Top deals – If any of these look good be sure to set yourself an alarm for 10 minutes before and then be at Lightning Deals Page ready to add it to your cart once the sale goes live. There are a limited number of items available at this price. Depending on how great the deal is it can last for just a few minutes or it can last for hours. Here are a few of today’s top deals! Elenco Snap Circuits Sound is 52% off! This is a great gift! 50% or more off Monster High – Lots of dolls under $10 and the High School is 50% off as well ! Check Out Today’s Amazon Holiday Toy Lightning Deals! Melissa & Doug Sale – Plus Extra 15% Off! Select Melissa & Doug Toys are an extra 15% off at Amazon. Many of these toys are already marked down making for some amazing bargains!!! These toys make great gifts. The prices you see on the main Amazon page do not include the extra 15% off. You will see the extra 15% off once you go to check out. Melissa & Doug Felt Food – Cookie Decorating Set – just $12.20 after discount! Melissa & Doug Stir Fry Slicing Set – just $13.36 after discount! Melissa & Doug Boys Coloring / Sticker Pad Bundle – Just $8.49 after discount or just $2.83 per book! Trunki by Melissa & Doug Sunny, Orange just $26.17 after discount! Amazon prices change quickly so be sure to verify the price before you buy. Check out all the Melissa & Doug Toys with extra 15% off! Amazon is having a Big Toy Sale ! Now is the perfect time to stock up on gifts for birthday parties and start working on holiday gifts. Many of these deals have gotten even better since the last time I posted this!!! I updated the prices in the post. After the discount my total was just $15.66 or just $5.22 a set. If these would have been full price with no promo the cost would have been $39.97! This is almsot 60% off! Here is a super deal on International Playthings Calico Critters Deluxe Village Doll House this house is 61% off!!! It is still expensive at $129.99 but it normally retails for $303.99. There are only 1 left as of now if you are interested. If you are looking for a little smaller Calico Criiters home , the Calico Critter: Luxury Townhouse is on sale too. There are some great deals on doll items for little or bigger girls! I love the Badger Basket Doll High Chair With Plate Bib And Spoon – Pink/White which is 49% off and just $18.90. We have this and my girls have loved using it for years. The Liv Doll Dancing Sophie is 50% and just $9.95! The Melissa & Doug Wooden Bake and Serve Brownies are super cute and marked down to just $11.73! This high quality toy makes a great gift and always get lots of play. The Happy Nappers Bear is 64% off and just $8.99. There are lots and lots more great deals that you will have to check out for yourself. Amazon prices change constantly. All prices listed above were good as of the time I wrote the post but can change quickly. Be sure to check the price of the item before you buy. You can drill down to the items you are interested in by using the left hand menu including age, gender, type of toy and more! Check Out The Amazon Big Toy Sale Today! 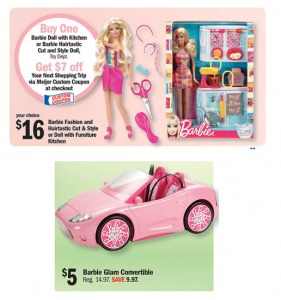 Here is an amazing bargain on Barbie toys for next week if you live near a Meijer! Even though the deal is for next week , be sure to print the coupon now since it could disappear tomorrow with the start of a new month. Pay $16.00 plus get a $7 checkout coupon valid on your next order. If you don’t live nearby a Meijer but happen to buy for a Barbie lover. You will want to print the $5 off $20 Barbie printable coupon for use at other stores. The coupon will print with “available at Walmart” in the bottom corner. However , the coupon can be used at other stores as well. Meijer has a great selection of Lego watches on sale for just $12.50. This is a super price on the watches and would make amazing stocking stuffers! Or you could stock up on them for birthday party presents. You will have to pay shipping which is $3.96 when you order up to 2 or $4.50 for three. Even after shipping, this is a hot price for the watches. There is a FREE shipping code if you purchase $99 or more. The code is 99SHIPSFREE. You could look around at the rest of the Cyber Monday Sale items to see if their any more items from your gift list to get to the $99 total. Barnes & Noble has some great offers going on for Black Friday! 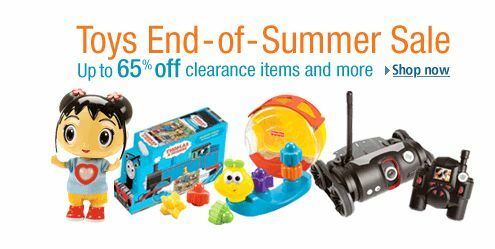 My favorite is this link which will get you 50% Off List Price on Any One Educational Toy or Game at BN.com! This includes Playmobil and Calico Critters! The Calico Critter Townhome is a super deal with this coupon and it is automatically applied when you click through the link! You can also get 50% Of 50 Bestselling Books at BN.com! Books make great gifts too. The Target.com $5 Off coupon is good through the end of the month. When you use coupon code TGT75HFN it will take $5 off any order. There are some great deals at the Target’s Daily Deals page today and they all ship FREE! You can get a long sleeve tee for just $3 shipped after your coupon. You do not need to put two in your cart to get the $8 price. Here is a copy of my cart to see how it works. The Daily Deals Section also has some girls underwear that will be FREE after the coupon! There is a cute boys Paul Frank hoodie too! Just found some great deals Top Toys at Target.com this all ship for FREE plus you can use the $5 off coupon. Get Monster High dolls, Razor Scooters, Elf on Shelf, Legos, Lalaloopsy dolls, Squinkies and more for $5 off and FREE shipping! The squinkie packs will be just $4.99 shipped and the Lalaloopsy dolls will be under $20 shipped! You must be logged in for the coupon to work, and you can only use it once per account. Shop Target’s Daily Deals Today! Right now Amazon is having an End of Summer Toy Sale . This is a great time to start your holiday shopping or stock your gift closet with some bargains. You will also want to check out the Toy Outlet where there and many more bargains. Just sort by Prime eligible and 50% off. LEGO City Corner (7641) Just 18% but I have not seen these marked down at all before. Price is $48.94. If you have been saving up Swagbucks and turning them into Amazon gift cards, you can save even more. If you are not signed up with Swagbucks, learn more and sign up for Swagbucks today. It is the easiest way to earn Amazon giftcards. These toy ships FREE with Amazon Prime or Super Saver Shipping. If you don’t have free prime shipping yet, sign up with Amazon Mom to get it for FREE. Remember you don’t actually have to be a mom to sign up for it either. If this Amazon bargain is not for you, be sure to check out all the other Amazon bargains I have found lately. (just scroll down past this post). Amazon has MANY bargains but their pricing fluctuates like crazy so I wouldn’t wait to buy if you see a bargain you like. Shop the End of Summer Toy Sale today!